Breakin News India 360: IP 2017: Suresh Raina becomes 1st player to feature in IPL matches! Raina had also captained for the Chennai Super Kings in three games, in the absence of MS Dhoni in 2010 season. In that season he scored 520 runs, also became season's top run-getter in ipl 2010. 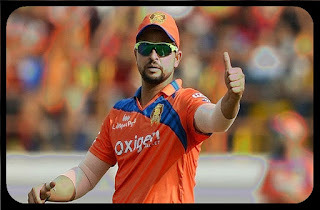 Gujarat Lions team's captain Suresh Raina became the first player in Indian Premier League to play in 150 IPL matches, during the clash against Rising Pune Supergiant at Rajkot on Friday 14th April. Raina ia also the highest run scorer in the IPL history with 4206 runs in 150 matches including 29 half-centuries and a century also. Raina, However is a handy all- rounder. He has taken 24 wickets at less than economy of 8 runs per overs which is good in T-20 format of games. He playing as Gujarat Lion's captain from last year IPL season 2016, but he stared his career with Channai Super Kings (CSK) in the inaugural edition of IPL. Raina had also captained for the Chennai Super Kings in three games, in the absence of MS Dhoni in 2010 season. In that season he scored 520 runs, also became season's top run getter in ipl 2010. If you like this please share and follow us for more updates.